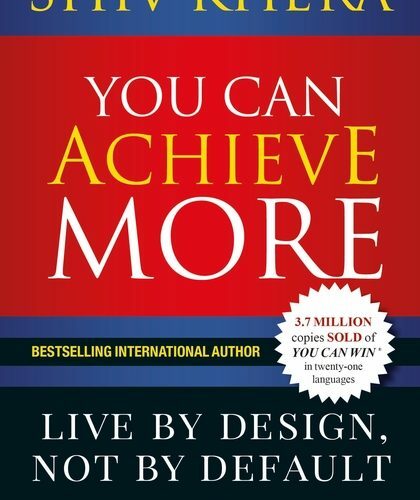 By @SimonCocking review of You Can Achieve More, Live By Design, Not By Default by Shiv Khera, available from Bloomsbury here. While it is often said that a person with a negative attitude cannot be helped, it is also true that a person with a positive attitude cannot be stopped. Life is an obstacle course in which we can often become our own biggest obstacle, but a positive attitude can be transformational. This book teaches not only the principles of success but also how to avoid expensive and demoralising mistakes. The principles themselves are universal, cutting across country, culture and religion. Diligently practising them will help you develop confidence and allow your life to become more meaningful and rewarding. Applying these principles may require a lot of self-discipline and commitment but, once learned and applied, the results can be rewarding and gratifying. If you want to be successful and happy, then become a student and study the life of successful people in depth; if you want to become wealthy, then study the principles of acquiring wealth. Learning to make a living and learning to live are two different things. This book helps you design a more meaningful life, by making positive choices and avoiding the most common pitfalls. Based on previous sales Khera’s books certainly seem to be hitting the mark in terms of reaching receptive audiences. Looking at general trends business books, we are seeing a tidal wave of books that aim to drive people to look inward, and be more self-aware into who they are, and how they treat others. It also helps to suggest why the Pendulum events in Dublin each year get such large audiences, with their slightly strange mix of business, new age mantras, Richard Branson and Conor McGregor!?!? In this context Khera’s book will probably do very well. Thankfully too there are enough interesting anecdotes peppered across the book to keep it readable, and more than just a series of theoretical mantras. Though it would also be a fair comment to say that some of those anecdotes have had a few outings now. Then again, wondering who the potential audience is, you imagine it might be frequent fliers, browsing the business books in the airport bookshops, looking for something on that three to seven-hour flight. In this scenario the book will probably work quite well. Overall we think it could be a helpful book, it’s sentiments are genuine, and if it does help to inspire a new generation of better, more honest, emotionally intelligent leaders, then they can only better than what is being served up over at 1600 Pennsylvania Avenue these days. Here’s hoping.